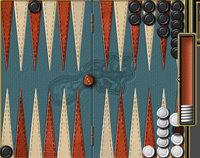 Backgammon is a two-player game, played on a board of 24 narrow triangles called points. The triangles are grouped into four quadrants (holding 6 triangles each). Each player has fifteen pieces of his own color. The initial arrangement of pieces is shown on the figure below. Each side of the board consists of 12 elongated triangles, called points. The pieces are placed on the board in a defined pattern show below at the start of the game. The Home Board is that half of the board which includes both players' home areas. The below image shows the home area of the white player lightened, while the home area of the black player darkened on the given board setup. The points are also numbered for reference. The image above shows the first six points numbered for white and black respectively. The home area of each player contains points 1 to 6. The 1 point for black is the same as the 24 point for white. The two players move their pieces in opposing directions, in continuous track in the shape of a horseshoe. Both players move their pieces towards their own home board on this track. A piece may be moved only to an open point, one that is not occupied by two or more opposing pieces. The numbers on the two dice constitute separate moves. For example, if a player rolls 5 and 3, he may move one piece five spaces to an open point and another piece three spaces to an open point, or he may move the one piece a total of eight spaces to an open point, but only if the intermediate point (either three or five spaces from the starting point) is also open. 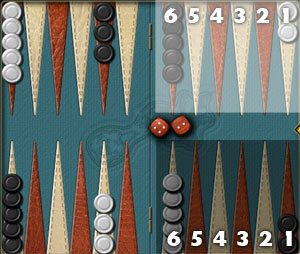 A player who rolls doubles plays the numbers shown on the dice twice. A roll of 6 and 6 means that the player has four sixes to use, and he may move any combination of pieces he feels appropriate to complete this requirement. A player must use both numbers of a roll if this is legally possible (or all four numbers of a double). A point occupied by a single piece of either color is called a blot. If an opposing piece lands on a blot, the blot is hit and placed on the bar. A blot or an empty point is considered to be open. Any time a player has one or more pieces on the bar, his first obligation is to enter those piece(s) into the opposing home board. A piece is entered by moving it to an open point corresponding to one of the numbers on the rolled dice. If neither of the points is open, the player loses his turn. If a player is able to enter some but not all of his pieces, he must enter as many as he can and then forfeit the remainder of his turn. After the last of a player's pieces has been entered, any unused numbers on the dice must be played, by moving either the piece that was entered or a different piece. Once a player has moved all of his fifteen pieces into his home board, he may commence bearing off, that is, removing the pieces off the board. A roll of 1 may be used to bear off a piece from the 1 point, a roll of 2 may be used on the 2 point, and so on. In order to bear off, simply move the piece off the board, at the common side of the board and the home board. The appearing box shows the pieces already borne off by both players. A dice may not be used to bear off pieces from a lower-numbered point unless there are no pieces on any higher points. A player is under no obligation to bear off if he can make an otherwise legal move. A doubling cube can be used to speed up play and add more depth to strategy in match play mode. At the start of the game, the cube is put in a neutral position at the top right corner of the screen. While the cube is in this neutral position, either player may propose that the game is played for twice the current stakes, by clicking on the cube on their turn. The opponent may accept it by clicking on the cube, or has to give up the match immediately. If the opponent accepts, the cube is moved next to his name, and is showing the current stake. The maximum stake depends on the amount of points required to win the match. The player who bears off first wins thegame. "Match play" means that the players play until one side scores (or exceeds) a certain number of points. The winner of a single game within a match gets 1 point if the doubling cube was not used. If there were doubles/re-doubles, the winner player gets as many points as shown on the cube. If a player has not borne off any pieces by the time the winner had born off all 15 pieces, it is said to be a gammon, which doubles the score. 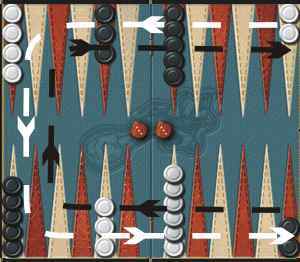 A triple game or backgammon occurs when the winning player has borne off all the pieces from the board yet the losing player has not removed a single piece from the board and at the same time, still has pieces on the opponent's home board or at the bar. The winning player gets three times the amount of the cube. Please note that the score of the game is not equivalent to the rating change of the players resulting from the given game, thought it has a significant effect on it. For rating calculation please visit the rating system description.